Get ready to begin anew with some of the the latest home decor style and color trends for the New Year! 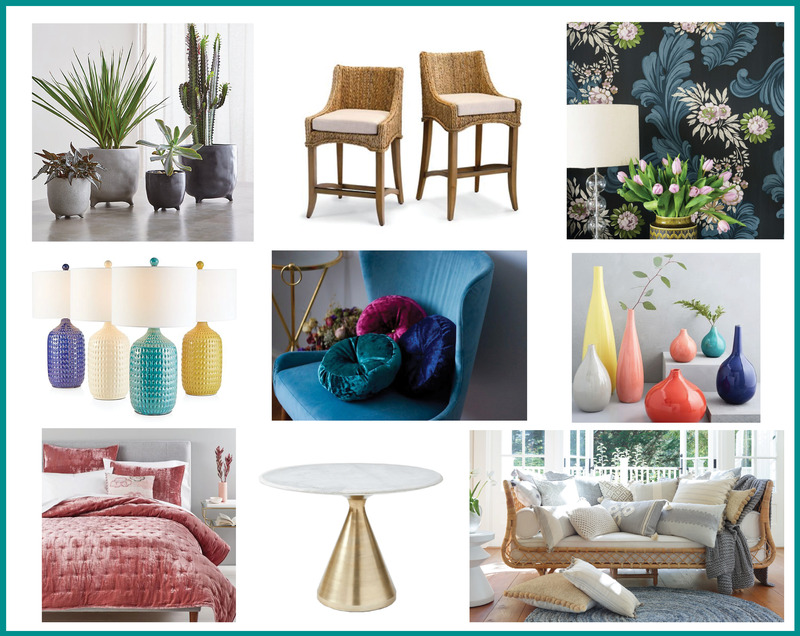 Think lush velvets and natural woven fabrics, planters with a mix of botanicals, wallpaper in bold patterns, warm bronze metallics, jewel-toned hues and the industry’s Colors of the Year in coral, blues and grays. We hope our picks below spark your interest and inspire you to introduce some on-trend style that will make a chic statement all year long. We love holiday decorating using everyday decor paired with fresh seasonal accents to give mantels, tables and entryways unique, personal style. 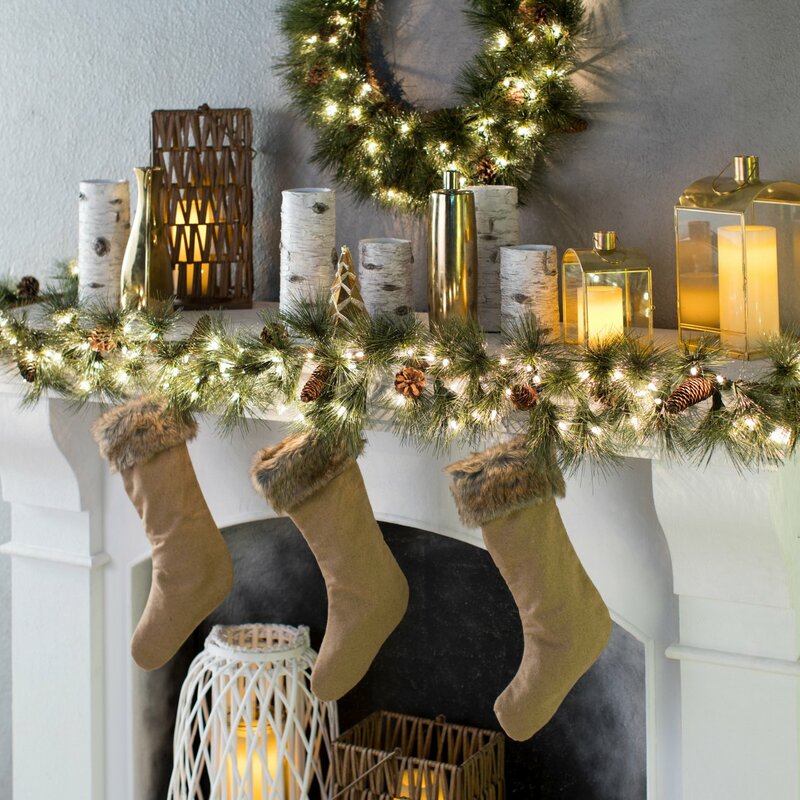 Below are three of our favorite holiday trimmings with tips that will inspire you to create warm and welcoming vignettes throughout your home this season. And don’t forget that the PJ & Company team can help you decorate your home with less stress and added style for the upcoming holiday season! 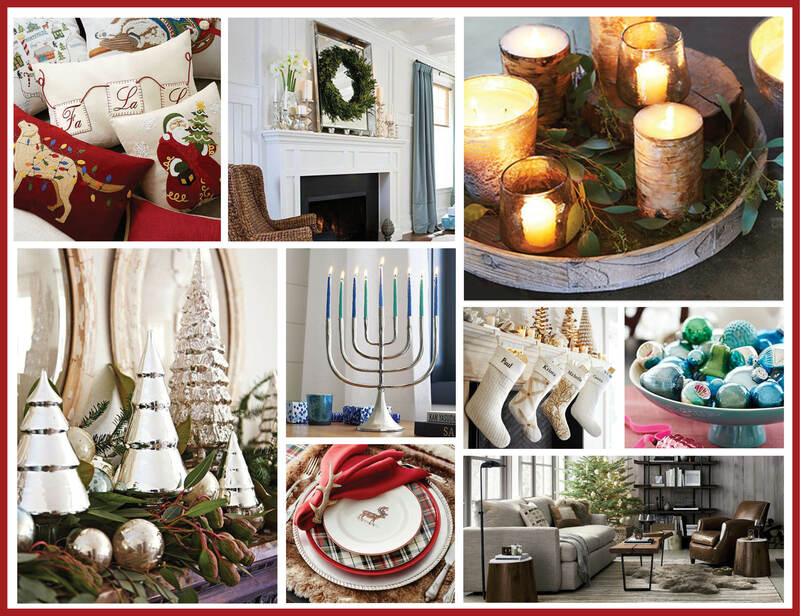 Call us at 203.640.3762 or email patti@pjstagingdecorating.com to discuss how we can create warmth and style to fit within your budget and schedule for the holidays. For unexpected elegant style, mix nature-inspired elements such as delicate twigs and birch wrapped candles with high-shine, gold and silver metallics and luxurious fabrics. Surround woodland or ceramic animals with glittery gold and mercury glass trees. Drape greenery on mantels with glass lanterns or hurricanes filled with sparkling ornaments and trinkets. Pair a chunky, wool cable knit throw with silky, beaded and faux fur pillows. For a traditional look with a twist, layer in texture by using on-trend tartan plaid pillows, bedding or dinnerware paired with animal print patterns and cozy faux fur fabrics. Create a relaxed, beach vibe by using coastal elements in whites and creams paired with accents in an array of trending blue hues. Arrange shells, starfish and coral in a rustic wood bowl with touches of greenery and metallic accents. Consider a white Christmas tree adorned with an array of silk peacock blue ribbons and shimmery ornaments. Color is one of the most dynamic and versatile design elements for adding personal style to your home’s decor. It not only sets the mood and tone, but can also bring out a room’s architectural features. Wallpaper is also back in style and can help add depth and interest to any room. Not sure where to begin when choosing a paint color or wallpaper pattern for your spaces? The following are some tips and creative ideas that we hope will inspire you. Start by considering your personal color preferences. Which colors do you gravitate towards – jewel tones, pastels, neutral? Collect images and swatches from Pinterest, Houzz, and other decor sources. Even consider your own personal experiences: vacations, nature, artwork, etc. that attract and inspire you. Group the colors and view them together in the room to see how they look with existing furnishings and during different times of the day (colors look different in the morning, afternoon and evening). Narrow down colors based on the vibe they evoke. Decorate with intention by choosing colors that have personal meaning and give you a sense of satisfaction. Hues from nature such as blue, green and tan feel tranquil, soothing and renewing. Bright yellows, oranges and reds enliven a space with warmth and energy. Darker colors convey mystery, drama and formality while lighter colors are lively and optimistic. Try lightening up a traditional brick fireplace by whitewashing it for a more modern look. Try using contrasting color on stairway risers and/or spindles for a dramatic entryway. Wallpaper can add style and dimension to any space. Consider using wallpaper as an accent wall in a small office or powder room. Keep the style of the wallpaper similar to your home’s decor – traditional, contemporary, rustic, etc. You should feel emotionally attached to the design so you won’t get tired of it quickly. In a room with many doors and windows, avoid large pattern repeats. Instead, choose a textured or solid color. Consider consulting with an interior designer who can help narrow down paint and paper selections based on your taste and budget. For more info please contact Patti Stern at 203.640.3762 or email patti@pjstagingdecorating.com. ‘Tis the season to add festive cheer to your decor. No matter what holiday you are celebrating, we have some great tips for bringing that special glow into your homes. Happy decorating! Silver and gold metallics will add chic style to any neutral room. We love the elegance of a mantle or dining table adorned with antique mercury glass candle holders and votives, classic white candles, touches of greenery and white amaryllis. Mix and match cozy fabrics and materials such as faux fur blankets, chunky knit throws, quilted velvet stockings, leather poufs, burlap pillows and red plaid fabrics. It’s a perfect way to layer in warmth an luxury to any space. Bring in elements from nature for a rustic look by using fresh evergreen and winterberry wreaths and trimmings paired with pinecones, twigs and fruit. Then pair with nostalgic touches such as embroidered pillows with wintry imagery and vintage designs, plaid dinnerware, ornaments and frames. Fill glass bowls and vases with colorful ornaments, candy, nuts, pinecones, pomegranates, kumquats or cranberries then top with a pillar candle for a unique accent. Try recycling wine bottles and use as candlesticks by replacing labels with metallic wrap or a bow. The possibilities are endless!